The hooplah you've heard is right on: Megan Smolenyak Smolenyak, Chief Family Historian and North American spokesperson for Ancestry.com and co-founder of Roots Television, will be in Spokane this coming 11-13 September 2009. 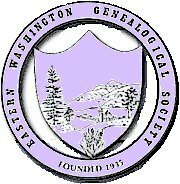 She is coming as principal presenter at the Washington State Genealogical Society's annual conference hosted by the Eastern Washington Genealogical Society. Megan will teach us more about newspaper research on the Internet, finding those pesky illusive ancestors, and understanding the importance of DNA research. Friday, September 11th, is the first day of the conference and on this day you will have the opportunity to attend a free beginners' class to be held from 10:00 to 12:00 at the downtown Spokane Public Library, and in the afternoon have the opportunity to choose from three optional off-site tours to either the Washington State Archives in Cheney, the MAC Museum/Campbell House/Eastern Washington Historical Society Library, or just stroll leisurely to the historic Bing Theater and through the Davenport Hotel (with guides). 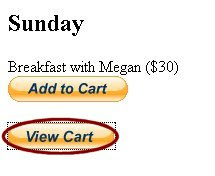 Megan will speak at the Friday night dinner, twice on Saturday, and again on Sunday morning. 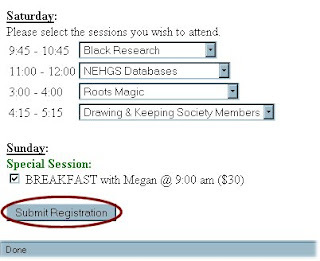 You can register for any of the above at the EWGS website (online registration or mail-in registration form). For goodness' sake, don't miss out!! Probably most people will drive and, we hope, carpool. Spokane is served by I-90, US 195, US 2, US 395 and numerous state roads. By the time of the conference, part of the North Spokane corridor will be open, but probably of little use to anyone coming to the WSGS Conference. Spokane International Airport has Alaska, Delta, Frontier, Horizon, Northwest, Southwest, United and US Airways airlines. Before 1941, it was known as Sunset Field, but then was purchased by the Department of Defense and renamed Geiger Field after Major Harold Geiger, an Army aviator. In 1946 it became Spokane Municipal Airport and got its present name in 1960. Spokane Transit serves the Spokane International Airport with buses arriving at the Plaza a block from the Davenport. Spokane has rail and bus service provided by Amtrak and Greyhound via the Spokane Intermodal Center. The city is a stop for Amtrak's Empire Builder on its way from Chicago. Through service continues once a night to both Seattle and Portland, a reflection of the old Spokane, Portland and Seattle Railway. The Spokane Intermodal Center originally was the Northern Pacific Railroad terminal and is located six blocks from the Davenport Hotel. Spokane Transit also serves the Intermodal Center. Coming to Spokane for the WSGS conference? Have a non-genealogist spouse or children and need something for them to do during the conference? The Spokane Interstate Fair will be going the weekend of September 11th, 12th and 13th of 2009. Riverfront Park a few blocks north of the Davenport has rides for the kids, the Imax theater and the antique Looff Carousel. You can also get on the Centennial Trail (which runs through downtown) and walk mostly along the Spokane River to Coeur d'Alene, Idaho. Do you like antiques? The North Monroe Business District and the Hillyard Business District both have many antique shops. Just want to go shopping? The Davenport is close to many shops, art galleries, theaters, and restaurants. Don't want to walk to the antique stores? Spokane Transit has their downtown plaza a block from the Davenport and for a dollar you can ride anywhere the buses go. They have a VIP fare for seniors over 65 (ID required) of 50 cents, or for $2.50 you can get an all-day pass. We also have a Local Activities Brochure with even more activities and details, which you can download here. Everything You Ever Wanted to Know About Genealogy Blogs But Were Afraid to Ask! My friend Thomas MacEntee put together a wonderful slideshow presentation called "Everything You Ever Wanted to Know About Genealogy Blogs But Were Afraid to Ask!" Thomas is the author of several genealogy blogs himself, including his personal one, Destination: Austin Family, Facebook Bootcamp for Geneabloggers, and the Geneabloggers blog. Among his many activities, he administrates the Geneabloggers Group on Facebook and he is also the technology columnist for Digital Genealogist magazine. He created the following presentation to show at the Southern California Genealogical Society's Jamboree this weekend. I think you'll find it enlightening and informative. If you missed today's computer class, "Honoring Your Ancestors and Loved Ones at the National World War II Memorial," presented by EWGS member Carol West Nettles, then you certainly missed out! Carol started out with an interesting and factual slide show on the purpose of the memorial, when, where and how it was created, and photos highlighting its details and symbols. She went on to give us a tour of the National World War II Memorial website (http://www.wwiimemorial.com), guiding us through the searches and then giving us a tutorial on how to register to be a contributor to the site. This website is free to use and you can honor your relatives or friends who either a) died serving their country during the war; b) are/were a veteran of the war; or c) were a civilian during the war but contributed in some manner, either as a spouse of a veteran, a civilian worker, or someone who was a member of the Greatest Generation and did their everyday part to win the war. I love that you can honor ordinary citizens as well as veterans and I've already decided to add my maternal grandmother, who worked in a factory in Grand Rapids, Michigan where airplane wings were manufactured. Of course, I'll add my three veteran grandfathers (two biological and one step), their combined seven brothers who served, and my paternal grandmother's brother who was in the Navy. I'm sure I'll find a few veteran brothers-in-law to add. I'll also add the women of that generation. Adding loved ones is free; contributing a photo to their memorial page costs $10. If you're a member of EWGS and would like a syllabus of today's class, please contact me. Also, members can contact me to sign up for the July 2009 computer class, "Using FamilySearchIndexing.org to Find Your Ancestors & Help Other Researchers," presented by Donna Potter Phillips. This class will be held July 18th in the Gates Computer Lab on the second floor of the downtown public library during two sessions: 10:15 to 11:15 AM and 11:30 AM to 12:30 PM. Computer classes are free and are open to EWGS members only. If you are not a member and would like to become one, you can see information on our website here and download a form. Membership is normally $25 a year; however, if you join after July 1st, you need only pay $15. The Kootenai County Genealogical Society will have its next monthly meeting on Thursday, June 18th at 7:00 PM at the Hayden Library, 8385 Government Way, in Hayden, Idaho. This meeting is free and open to the public. The topic will be Group Sharing. What are your summer genealogy plans? Have you found something interesting or have a brick wall to conquer? Did you receive a family heirloom recently? In addition, the KCGS would like to remind the public that genealogists are available to assist you with your research each Wednesday from 1:00 to 4:00 PM at the Hayden Public Library. If you are a RootsMagic user, or are simply curious about this genealogy software program, you may be interested in the RootsMagic Users Group, which meets at 7 PM on the third Thursday of each month at the LDS Church at 808 E. Sitka (this month's meeting is on June 18th). Lew and Trudy Lundy lead this group. For more information, e-mail them here. 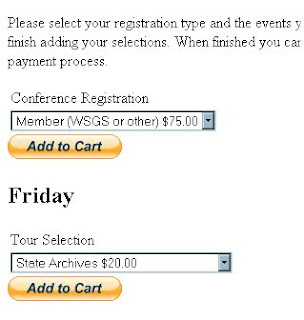 Online registration is now available for the 2009 Washington State Genealogical Society's State Conference, to be held September 11 - 13 at the world-famous Davenport Hotel in Spokane, Washington. This conference will feature Megan Smolenyak Smolenyak as our main speaker. You can register for your classes AND pay for them using a debit or credit card or your Paypal account. To register online, go to this page. If you need more information before deciding what you'd like to participate in, you can see details about Saturday's sessions and instructors here, and peruse a brochure with information about Friday and Sunday's activities here. Every meal featured is a Davenport-quality gourmet meal combined with the privilege of hearing Megan speak. Using the online registration and payment option may be a new experience for some, so I've provided the following tutorial. 8. Fill out the online form to add your debit or credit card. Click the yellow button at the bottom of the form to complete the process. 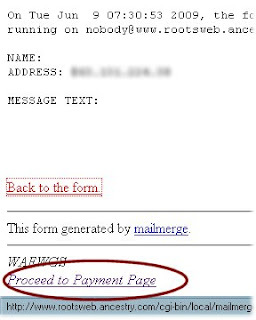 An e-mail will be sent to you from Paypal confirming your transaction. 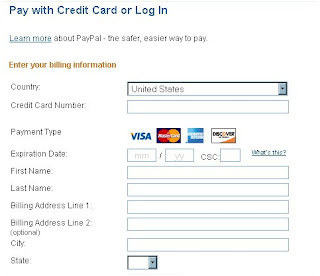 Using Paypal is a safe, convenient, and speedy process. I have used Paypal for many years for various online purchases without any trouble, including purchasing my Subaru via Ebay about 10 years ago! However, if you prefer to register and pay by mail (checks only), you can download and print the registration form here and mail it to the address listed on the form. If you are looking for accommodations, the historic and grand Davenport Hotel is offering discounts to conference attendees. Enjoy the conference in style, knowing you are walking the same floors as "royalty, kings of industry, captains of commerce, stars of stage and screen and nearly every American President of the 20th Century." Do you have a spouse or friend accompanying you who is not interested in genealogy? Do you have some extra time on your hand and would like to know what activities are available in Spokane? Download the local activities brochure here. For general information (parking, special offers, tours, directions, etc. ), see our General Information page here (there are currently text errors on this page, which will be addressed shortly). The June 6th, 2009 meeting was held at the Downtown Spokane Library, and it was a nice day for the potluck and stories. Too bad not many attended, as we had a LOT of good food and ended up with a lot after the meal. Dani Lee McGowan's story about the snake was great, Cecily Kelly told of the trip to 12 archives in 10 days with Donna Phillips, and Pat Bayonne-Johnson told of finding a grave of a research subject at Spokane Memorial Garden Cemetery with just a numbered stone. All the stories were great. I got to remembering a research request I got several years ago for a gentleman in Switzerland. He was actually a Spokane native ( a grad of N.C.) and a member of the peace keeping troops in Bosnia. He rented an apartment in Switzerland for his family and spent as much time as possible with his family. He found on the internet his uncle was buried at the Medical Lake cemetery and asked for an obit. When on leave he wanted to visit the grave and when he did he found a numberd stone in a group of five numbered stones. He got the names of the others and I found their death dates and got copies of their death certificates from the LDS. He was going to have a stone made for all five graves.